> Products>Theology and Doctrine>Works of William G.T. Shedd - 12 vol. Works of William G.T. Shedd - 12 vol. This 11-volume collection includes Shedds greatest works such as Dogmatic Theology and Critical and Doctrinal Commentary on Romans. 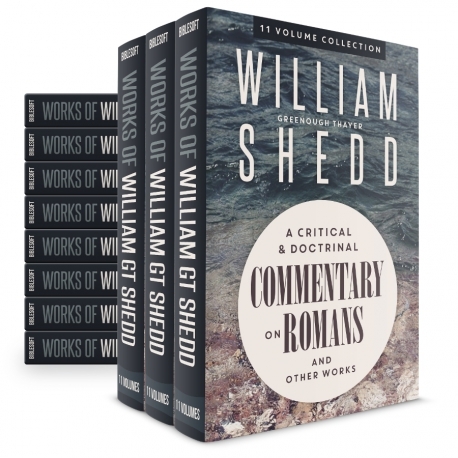 Shedd's use of the Greek language in these works makes this package an exciting addition to your PC Study Bible library. Dogmatic Theology occasions pure joy for all who are devoted to biblically sound and historically alert theology. Here they will encounter an energetic and well-stocked mind laboring diligently to perceive the truths of Scripture, chart their interrelations, and follow their implications through high and reasoned speculation. Alan Gomes's introduction—itself an inviting invitation to the delights of historical and systematic theology—identifies not only the peculiar strengths of Shedd's work, but also ways it can correct many errors of more recent theology. The English translations of Shedd's many untranslated quotations enhance the work's accessibility, as do the glossaries, which by themselves may instruct readers in theological terminology and biography alike. An eminently useful publication and a significant service to the church. The second part of the volume is devoted to the vital subject of Pastoral Theology. 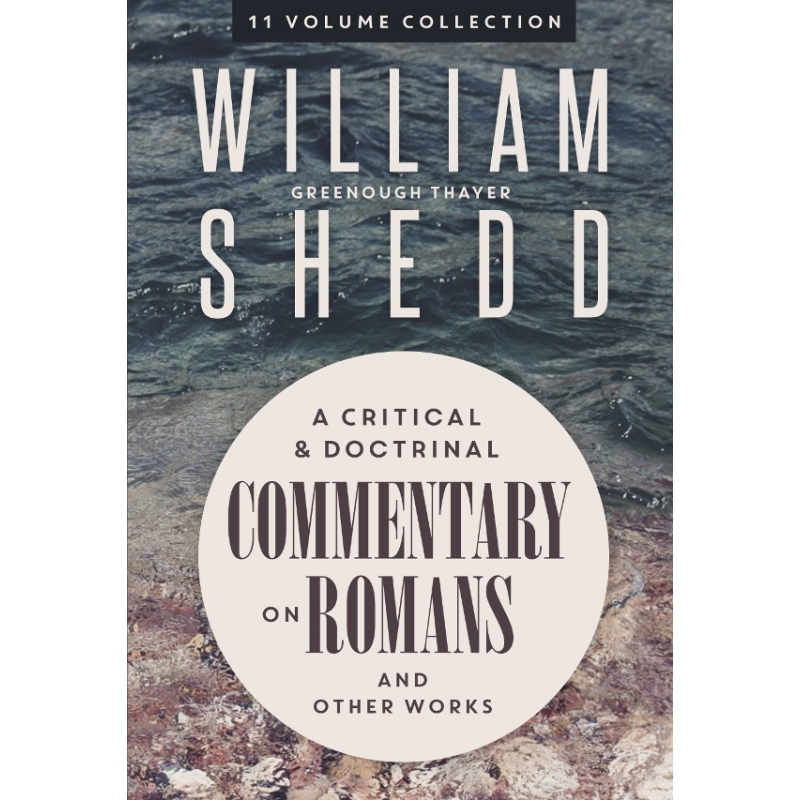 Here Shedd is equally thorough and deals with the essential character of a minister, his way of life, his duties, his work of visitation and finally, his work of catechizing his people so as to be informed as to their progress and position in relationship to the preaching. Although much shorter than the first part of the volume, this material is of immense value, and is worth the price of the book. This 430 page book contains 20 sermons to the unconverted man. In the words of A.A. Hodge: "Dr. Shedd's 'Sermons to the Natural Man' are, if not absolutely the best, yet of the very best doctrinal and spiritual sermons produced in this generation. We have known much of their power in convincing sinners, and in deepening, widening and exalting the experience of true Christians. Doctrinal preaching, though not in fashion, is the preaching that we need, and the preaching which always best vindicates itself when put to the test of practice. And of all the examples of doctrinal preaching in this generation, the sermons of Dr. Shedd excel in many particulars. He grasps the very heart and soul of the truth. He holds it in its entirety with uncompromising loyalty; he states it with wonderful clearness and accuracy, and illustrates and applies it with singular facility and grace of style." This 420 page volume contains 26 sermons, and in the words of the author: "This volume is complementary to another, published in 1871, under the title of 'Sermons to the Natural Man.' In the earlier volume, the author aimed to address the human conscience. In this, he would speak to the Christian heart. The former supposed original and unpardoned sin, and endeavored to produce the consciousness of it. The latter supposes forgiven and indwelling sin, and would aid in the struggle and victory over it." Composed of numerous articles relating "to principles in theology and ethics which are eternal, and vehemently opposed in the standing conflict between orthodoxy and heterodoxy." Shedd notes that in this war "[t]here is nothing new in the orthodoxy of today; and nothing new in the newest heterodoxy. A scholar vested in ancient learning can trace both alike in the antagonisms of the past. Speaking generally, the orthodox respects and cultivates systematic theology; the heterodox contemns and vilifies it. The former maintains the carefully stated creeds of the evangelical denominations; the latter seeks to revise, relax, and nullify them. Orthodoxy defines Christianity to be an exclusive religion, distinct from all others, and intended to convert them; heterodoxy explains it to be a conglomerate of all religions, and destined to be merged and lost in them."